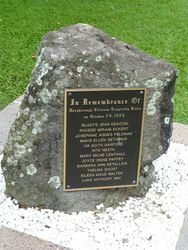 A monument commemorates the twelve people from Maryborough who died in the Wide Bay Tours Bus Accident at Boondall in 1994. Eleven women and a child were killed and 39 people injured in Queensland's worst bus crash when a tour coach overturned and skidded on its side across a highway and down a steep embankment in the outer northern Brisbane suburb of Boondall yesterday. 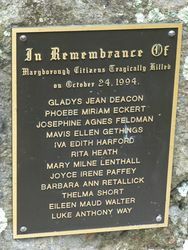 The Wide Bay Tours coach was carrying 50 passengers, most of them members of a widows' support group from Maryborough in central-southern Queensland. They were on a shopping trip to the Logan Hyperdrome on Brisbane's southern outskirts. Police said the child killed was a boy aged two. Twenty-five ambulances and four medivac helicopters were used to ferry the injured to Brisbane's four major hospitals and to hospitals at Redcliffe and Caboolture. Thirty-two people were still in hospital last night, including the 18-year-old driver, who suffered serious injuries. 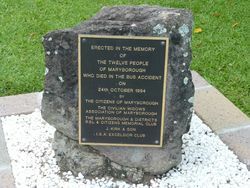 The accident happened at 10.10 am, only 20 minutes from the bus's destination, near Brisbane Airport. A Queensland Police Service spokesman, Mr Brian Swift, said: "The coach somehow left the southbound two-lane highway just after coming over a slight rise. It crossed a two-foot-deep ditch between the north- and southbound carriageways, came out of the ditch and slewed across the northbound lanes, demolishing a telephone booth and falling. It then ploughed, savagely, down a 15 foot embankment into a dry swamp." There was no official explanation for the crash last night. Witnesses, including the coach driver, said the coach shuddered before it ran off the road. Sydney Morning Herald, 24 October 1994.